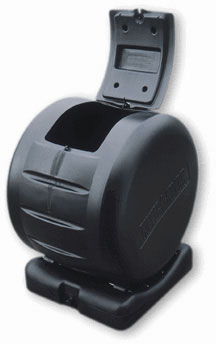 The Envirocycle Composter is a nice compact unit. The tumbler part sits on a base that is about 2.5 feet by 2 feet, so it only uses about 5 square feet of your precious deck, patio or balcony space. This composter is made in Canada of UV stabilized recycled plastic. Base - Liquid can drain from composter and collect in the base. Base holds about 5 gallons (19 liters) of liquid. The company, Envirocycle Systems in Canada is committed to good customer service. 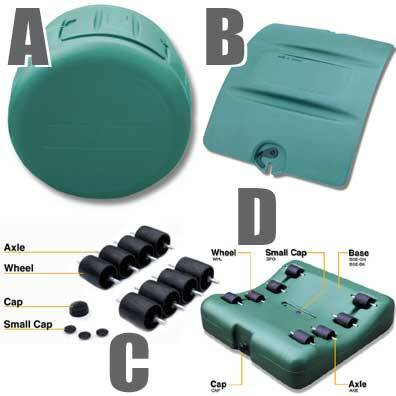 In a recent review one customer, a person who actually bought her unit second hand, contacted the company to get a replacement cap for the compost "tea" collector. The company sent two caps out on the same day at no charge. The composter is very compact so fits easily on a deck or even an apartment balcony. The capacity of this compost tumbler is 7 cubic feet. You'd probably only actually load about 5 to 6 cubic feet into the composter so as to leave room for the material to move around as you turn the tumbler. This may seem small, but for many households this is big enough to handle their kitchen wastes. The tumbler is mounted horizontally. Most people find it easy to rotate the tumbler. One person commented that her son has been handling that chore since he was eight. The barrel of the composter can be easily taken off the base. To do this hold the base steady with your foot and twist the barrel. You can then roll it over to wherever you are planning to use the compost and empty the barrel there. The tumbler keeps the compost neat, tidy and relatively pest free. You can leave this composter outside all winter. It's okay to keep adding to the unit over that time. They advise not turning it. However, through the winter the material will freeze and thaw several times which starts the breakdown process. In spring you start turning the barrel and carry on. While most people are happy with their envirocycle composter, there are some people who have issues. For the most part these are issues that are inherent with compost tumblers in general. Our Composting Tips for Tumblers page is a good one to use to solve most problems. Tumblers are batch composters. This means that you have to stop adding materials at a certain point and allow the material to decompose. This could take as little as a couple of weeks or as much as 10 weeks if you are looking for compost that looks like soil. The fans of this composter solve this problem by investing in a second unit. Once the first unit is about three quarters full, they switch to filling the second unit. Several weeks later when number 2 is full they empty the first and start refilling it. Some people find this composter difficult to turn. It does get heavy when full so you will end up having to work a little at it to turn a full load. Some people have problems with the lid and the latch. Essentially the lid sometimes doesn't stay closed. This would be an irritation, that's for sure. If I had such a problem I would contact the company as they do have a five year guarantee. If you are not rolling the whole barrel to where you plan to use the compost emptying the unit can be awkward. Getting the compost "tea" out of the base is also awkward unless you take the barrel completely off. As an aside, the company calls this liquid compost tea. It is not really compost tea - it is leachate. This material can be diluted and used as a fertilizer but should not be confused with compost tea. Compost tea is made with compost, a special brewing set up and an aeration device. I recommend the Envirocycle Composter. It's a nice compact solution for the urban dweller wanting to create compost from kitchen scraps. Be aware that you'll soon be faced with the dilemma of whether or not to buy a second unit, something to fill while your first unit is baking. This composter is available in the USA through amazon.com. Ironically, Canadians will not be able to order this Canadian made unit through amazon. However, it is available through Lee Valley Tools in Canada. It sells under the name Rolling Composter at Lee Valley. You may want to check out our Tips for Tumblers Page for trouble shooting tips.